The use of language is a territorial act. It delivers a context within which we reside. Its erasure, effacement or concealment displaces us from the perceived co-ordinates we depend on to trace our very presence. 'Relocating presence' raises questions about one's position in an ever-fluctuating context, and possibly reveals a reluctance to confront and/or define a reality. This artwork began with Divecha noting something askew on his usual route to work. All the road signs were wrapped in black garbage bags along this single 3km stretch (due to new road works). This gesture came across as an act of ‘unclaiming’, which in turn put into question the relation with the land he was navigating. The to and fro journey down this nameless street would leave behind a sense of spatial amnesia and dislocation. In the continuing months parts of the land (in question) he drove over were uprooted, fracturing the relation further. This record has been translated into an artwork that compromises two installations. Firstly, rows of black garbage bags are suspended in line to form a length that alludes to the artist’s commute. Hung upside down the bags are symbolically emptied of any scripted content, forming an undefined wavering volume. Alongside are photographs from the site that provide documentation. 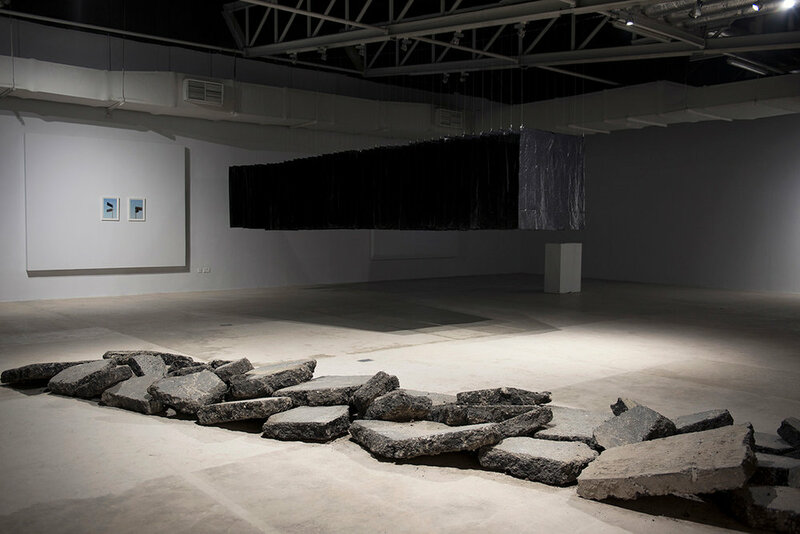 The second piece (which has identical length and width dimensions as the first installation) includes uprooted asphalt extracts placed on the floor. Their uneven behavior prevents one from traversing over this familiar surface, displacing the viewer off the artwork. Divecha works and resides in sectors of Dubai which were developed within the last decade. This project was supported by Mr. Paneer Selvam & team (Dutco Belfour Beatty LLC) and Mr. Surjeet & team (Dutco Belfour Beatty LLC). ‘Relocating Presence’ was created for a group show titled ‘In The Absence of Script' curated by Noor Al Suwaidi.